MONDAY CHIT-CHAT : YELLOW HAPPY ! Good Morning my people, how body? How was your weekend? Hope you enjoyed it sha? Mine was fun and hectic (which it seems to be lately). However am not complaining. Una know as e dey go: The first to leave a comment gets airtime recharge, so leave a comment with your email address. Riwostic and Tutusco are here! You forgot Riwostic has a baby sister now? Ah! She's about 4 months old ( as mom's would say " she's 16 weeks old" LOL ). This Riwostic is such a handful and a talkative (for a two year old) and all she kept asking for was " Uncle Ami" aka Uncle Yomi. She no even miss me. I love my nieces!!! I love a full house. I had two highlights this weekend, one was my shoot on Saturday and the other was on sunday. What shoot am I talking about? The Maggi Shoot! I spent all day filming for Maggi, alongside Toke Makinwa who is such a cute fine geh, like a doll. So pretty! What were we filming? Toke cooking, she will prove to y'all she can cook! I learned something from her too: how to chop onions with fork and knife- she doesn't like to touch onions with her fingers. She also introduced me to a restaurant, "Spice"...I can't wait to go there. They have this nice fire abi spicy spinach...it was delicious and very nutritious! We learn new things daily. Sunday was my Bridal Shower! YAY! I really appreciate my friends that turned up especially on such short notice: all of una na #DoroMegaSuperStarO! LOL. I appreciate my sisters for organising it too. It was fun! Congrats to Germany oh for winning the World Cup: they deserve it! They played good from beginning to end. I will never forget the embarrassment they gave Brazil...7-1! That was bloody embarrassing. I bet Goetze is the DonDoroBucci now, for saving the day! I will miss watching this world cup...football is much more fun when you're tweeting and watching. Awww... Looks like a great photo-shoot. Can't wait to see the outcome. I think I spied Olive Oil Edge Control hahaha! Naturalista tinz. I can see you left out your natural hair with the Bohemian Curls. Do you have to do anything in particular for your natural hair to blend with the bohemian curls, without it shrinking, seeing as they are different hair textures? Congratulations again on the impending nuptials and I spy fabulous fashion blogger Velma Williams at the bridal shower. All the best on YomYem2014! I bow for you ooo sisi Yemie ooo. Where is our iv nau? You look so beautiful, congrats...abeg rest well so you can be fresh on your wedding day oh. SISIYEMMIE, HAPPY MARRIED LIFE IN ADVANCE. WISHING YOU ALL THE BEST THAT COMES WITH MARRIAGE. Sisi Yemmie!! Congrats ohhhh!! I'm happy for you!! Your knuckles are black. Bleaching! I'm glad you had fun this weekend and congratulations in advance for your wedding! That Dorobucci song is every where!! WHAT IS THE BEST MARRIAGE ADVICE YOU GOT ? 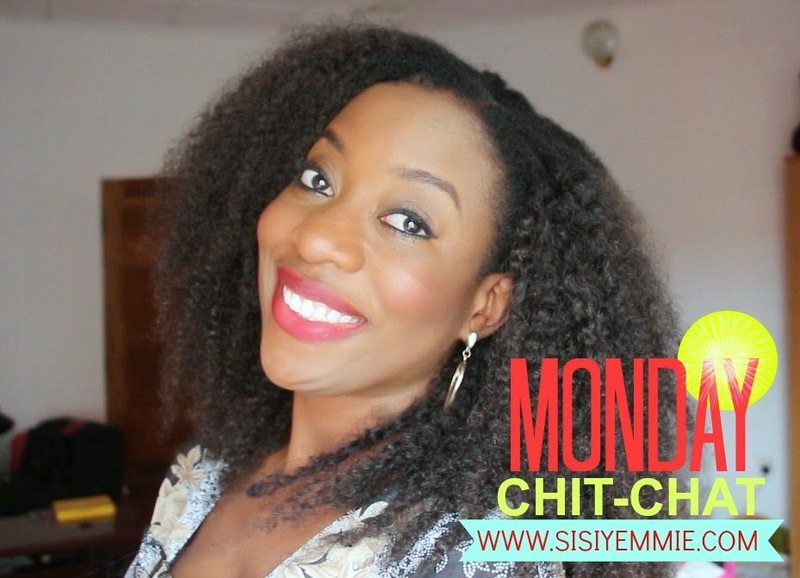 MONDAY CHIT-CHAT : HONEYMOON TINZ! MONDAY CHIT-CHAT : MEET MR & MRS O! MY FAB HAIR FROM MERCY HAIR EXTENSIONS! MONDAY CHIT-CHAT - HERE, THERE, EVERYWHERE! #BUGOSOMTO2014 : A WEDDING FEATURE!